It is perhaps one of the most famous endings in Hollywood history, capping one of the greatest films made. With fog swirling around Casablanca's airport, Rick Blaine and Captain Renault consider their options and decide to head for Brazzaville and the Free French……….."Louis, I think this is the beginning of a beautiful friendship.". 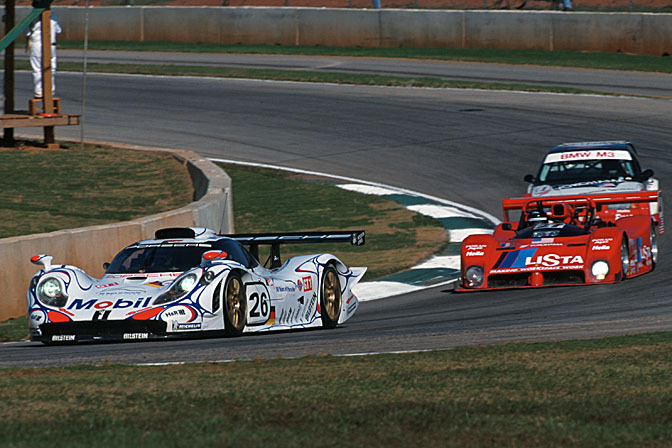 When the flag dropped on 11th October 1998 to mark the end of the race, about ten minutes shy of ten hours into the first running of the Petit Le Mans, you could well imagine Don Panoz and Michel Cosson trying to find something along those lines to say to each other. Even back then it was clear that this fusion of North American sportscar racing and the world's greatest race, Le Vingt Quatre Heures du Mans, had been a success. 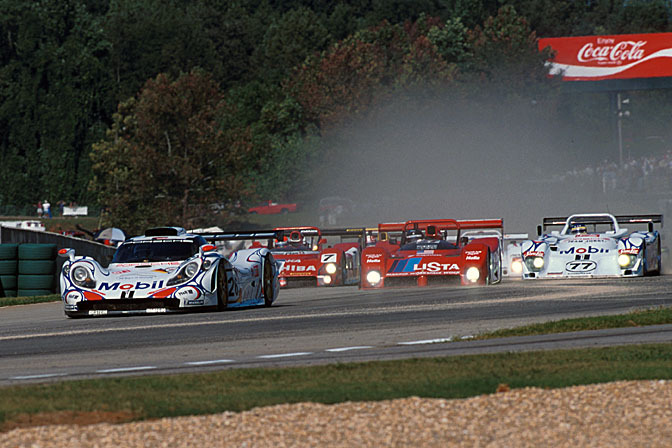 Just how successful and how important PLM and the competition that it presaged, the American Le Mans Series would be to motorsport in North America would only become fully evident with the passage of time. 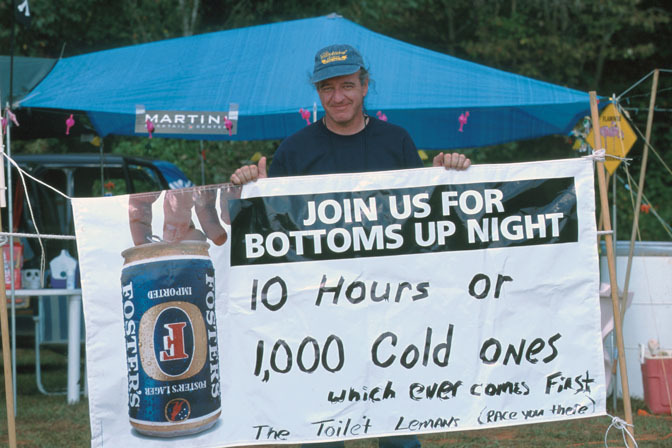 But back then around the camping grounds and the paddock the general consensus was very positive and optimistic. 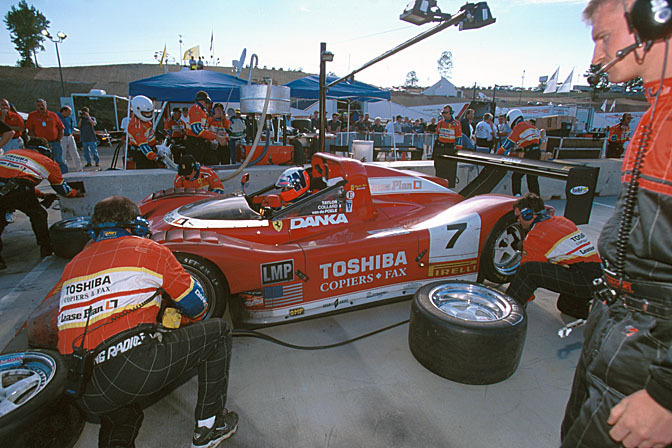 Endurance racing in the US and Canada had hit a low point in the 90's after the demise of IMSA. 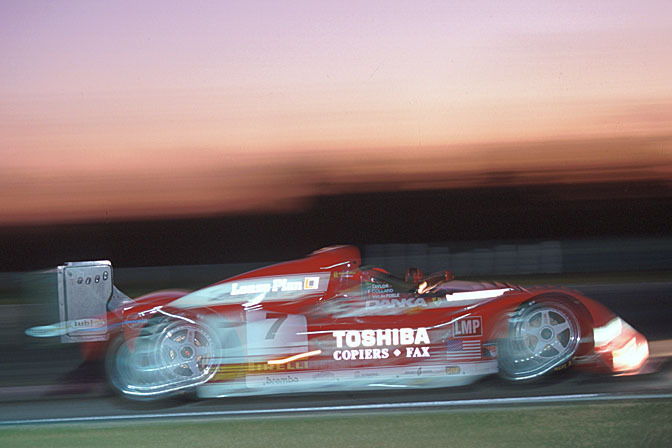 The flame had been kept alive with the traditional events like Daytona and Sebring still attracting good grids but political in fighting had led to rival series (PSCR and USRRC) being run in 1998 and 1999. 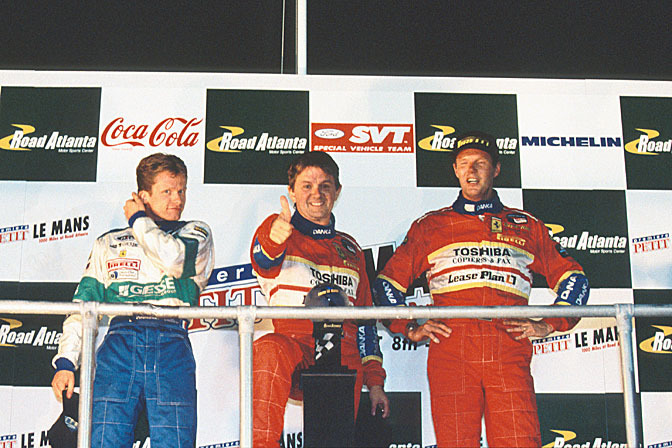 The rivalry mirrored that of the CART/IRL split of the time, though without the bitterness that fued fuelled, perhaps because basically the same group of cars raced in both series. As an aside it is hard to imagine now when surveying the smoking, wreckage of Champ Car that the organisation raised around $100 million on the stock market in 1998. It was time for a fresh approach and Doctor Don and the folks in Georgia were the answer. By using the rules drawn up by the ACO to govern the one sportscar race that actually mattered to car manufacturers, they could tap into the desire of import brands to parade their wares to the enthusiast sector of the market. 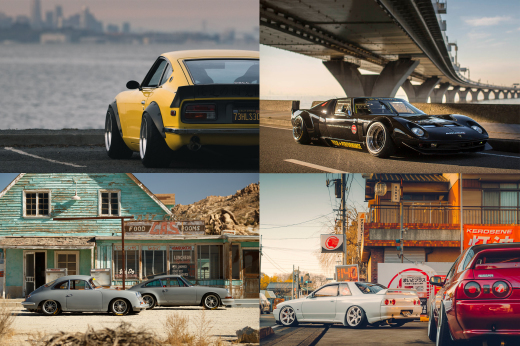 They could also access existing competitors from Europe, indeed one of the complaints in the early days of the series was the it was not focussed enough on the American contingent. 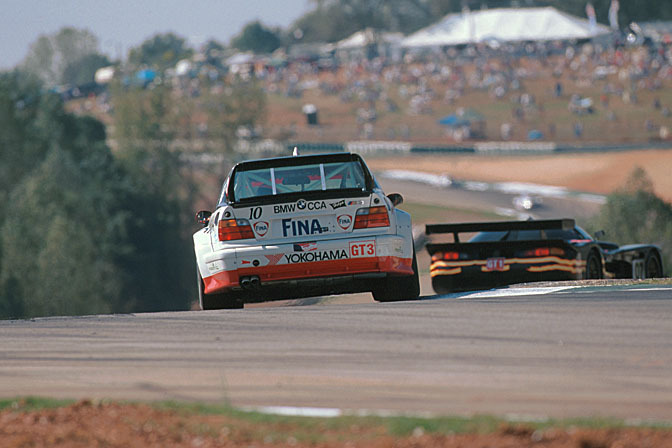 The first step was to assemble a respectable grid, not easy in 1998 for what was essentially a stand alone race. 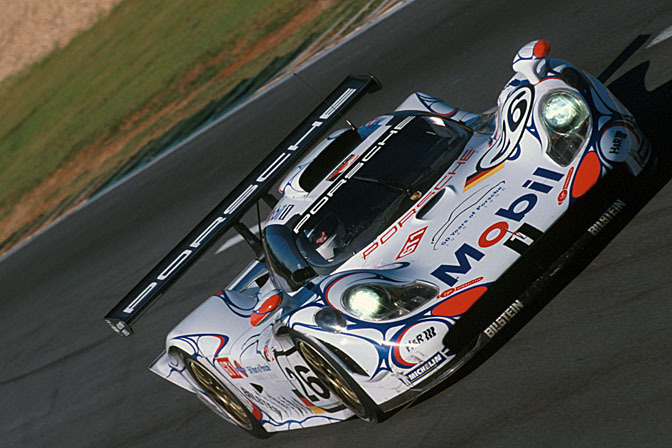 The final two rounds of the FIA GT Championship were to be held later that month on the East and West Coasts of the USA, so that might reasonably be seen as source of competitors but in the end only Porsche sent a singleton 911 GT1 98 from the GT1 class for Allan McNish, Yannic Dalmas and Uwe Alzen. 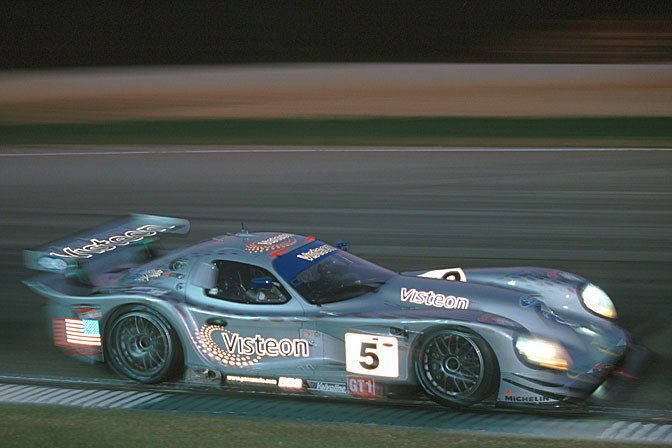 Despite stories that the FIA viewed Panoz as competition and therefore discouraged participation, the European GT2 contingent numbered four, a Marcos and three 911 GT2s. There were the usual suspects from the WSC series minus Rob Dyson's team, a spat about rules causing that, so three Ferrari 333SPs and 5 Riley & Scotts plus two Panoz GTR-1s. There were also a couple of interesting one offs from Europe. The TWR Porsche LMP1 98 with full Porsche werks backing plus Michele Alboreto, Stefan Johansson and Jorg Muller had to be a contender given that it won Le Mans outright in 1996 and 1997. 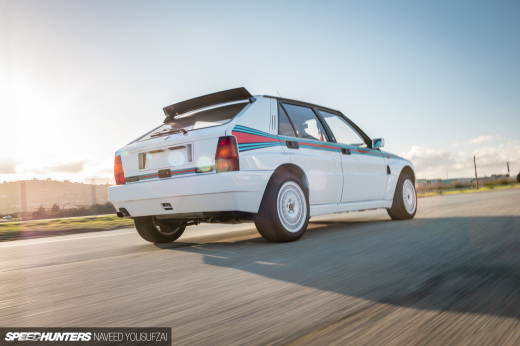 The "improvements" that AG had made to the car allowed it to run easily with the Ferraris. 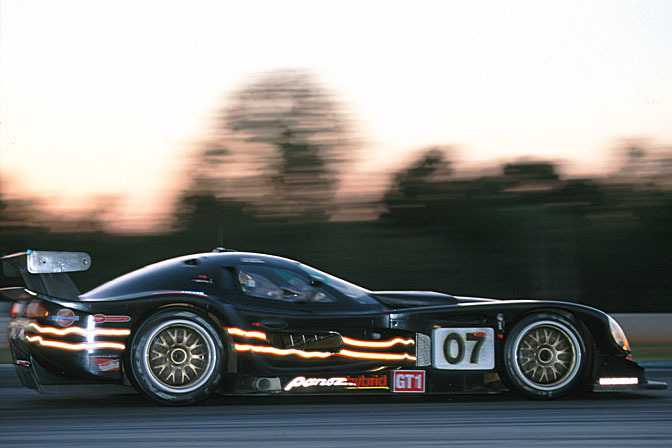 PLM 98 would mark the first race for a hybrid sportscar, with the Panoz Q9 run by David Price on behalf of Panoz. The car had failed to qualify for Le Mans but was a welcome addition to the grid at Road Atlanta. 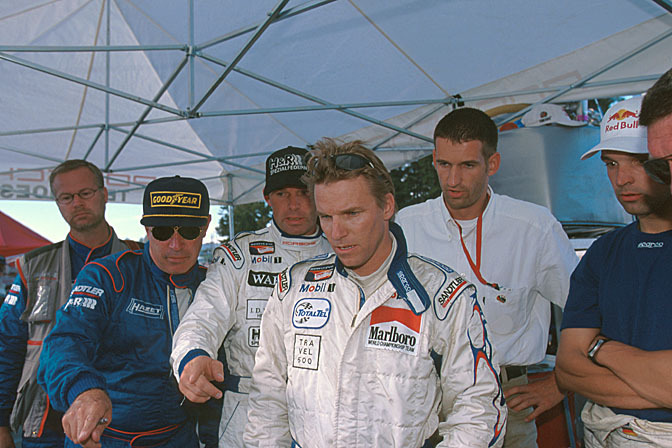 "Sparky" qualified a conservative 12th and the aim was to get to the finish, at least that was the order to the three drivers, John Neilsen, Christophe Tinseau and Doc Bundy……….all regarded as a safe pair of hands. 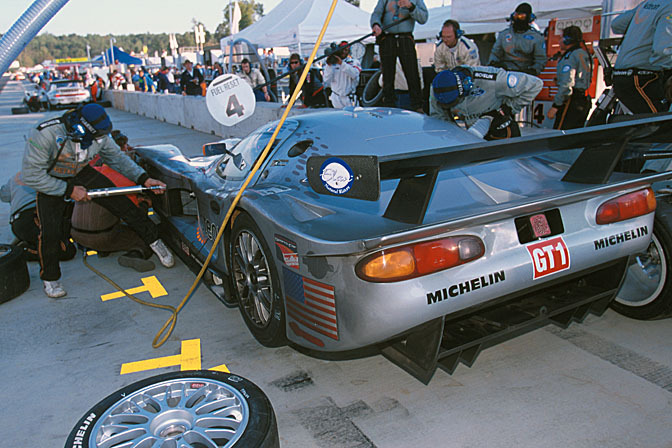 Not so safe was one of the Panoz GTR-1 s which had to be scratched from the race after being backed into Turn 12. That and a blown engine for the F Solution Riley & Scott meant that the field was reduced down to 31 to actually take the Green Flag. McNish took off like a jackrabbit at the start, the 911 GT1 98 had the legs on everything else at the track and he needed no encouragement. Behind the Ferraris of Theys and van de Poele scrapped with The TWR Porsche of Alboreto and the Panoz of Brabham. The first contender to drop out was the Lista Ferrari which had fuel problems that stranded the 333SP out on the circuit. The race settled into a pattern with the leading Porsche rattling the laps off under the pleasant Georgia fall sunshine in a controlled manner. But all that was to change dramatically just after the halfway mark. I was waiting in the Porsche pit for the leader to stop, Dalmas to get out and Alzen to get in and me to get my pictures. 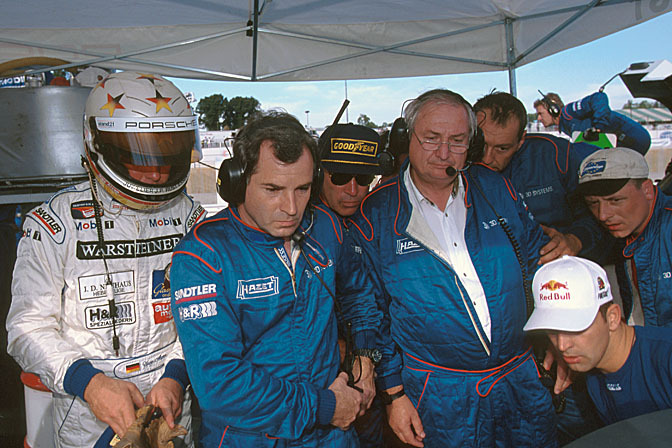 Suddenly there was a great commotion and everyone was huddled round the TV screen watching Speed replay the incident, here Porsche Motorsport boss Herbert Ampherer tries to speak to Dalmas, while Alzen, Norbert Singer and Muller look on in shock. What had happened is that Dalmas closely following a prototype crested the hump on the back straight and lost all downforce causing the 911 GT1 98 to perform a backflip, yes you've all seen it on YouTube. It was scary, look at Jorg Muller's expression (on the right) and I attest to the fact he does not scare easily. Johansson and Alzen try to figure out what was going on. The good news was that Yannick was fine and indeed the car was in relatively good shape, certain to be at Homestead the following week. This left the Panoz in control of the race and it looked like a fairytale beginning for the Home Team but engine failure some 100 odd miles from the flag ended the dream. So rising to the top came the Doyle Risi Ferrari 333SP with Wayne Taylor and Emmanuel Collard joining van der Poele on the podium. This meant a clean sweep for the Ferrari in the long distance events in North Amerca, PLM joining Daytona, Sebring and Watkins Glen to complete the set. Micholotto's (builders of the car for Ferrari) representative, Luigi Dindo, was singing for all he was worth after the race, at least we knew where the Champagne had gone and no, he was never going to worry Pavarotti. Second place overall and just over a minute behind the Ferrari was the TWR Porsche LMP1. 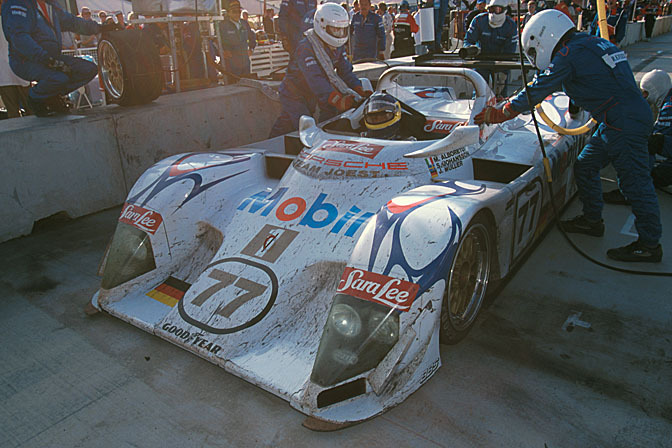 The first Petit Le Mans was a very important to the survival of road racing in North America. It kick started the ALMS and set down a philosophy of manufacturer based competition and innovative technological development that is completely at odds with the way that its rival GrandAm goes about business. The 300 Pound Gorilla in US motorsport is NASCAR, with its huge success over the past twenty years but increasingly the "Racertainment" solution is coming under question. The Detroit Big Three have serious financial issues at stake and it is no secret that they would like to change the terms on which they do business with the folks on Daytona Beach, actually like is too soft, they HAVE to do it, survival is now the objective. Who will win that battle will be interesting. The ALMS has had its issues during the past decade but if you look down the entry list for tomorrow's race there are factory efforts from Accura, Audi, Corvette, Ferrari, Peugeot and Porsche, all running to different agendas and configurations. There is once again a hybrid entry and the whole issue of petrol at $150 a barrel is being addressed both by the ACO and the ALMS and of course the manufacturers. 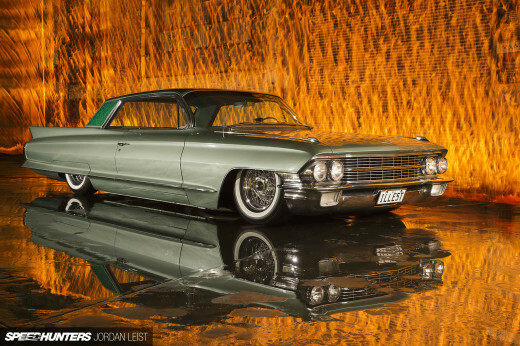 They are not running stock cars, with decals to differentiate them and carburettors are nowhere to be seen. This position of relevance to the real world of 21st Century motoring may be the the factor that will enable the ALMS to prosper in the next few years. Dinosaurs once ruled the earth but with the change in circumstances the smaller, more adaptable mammals took over, a parallel to consider. 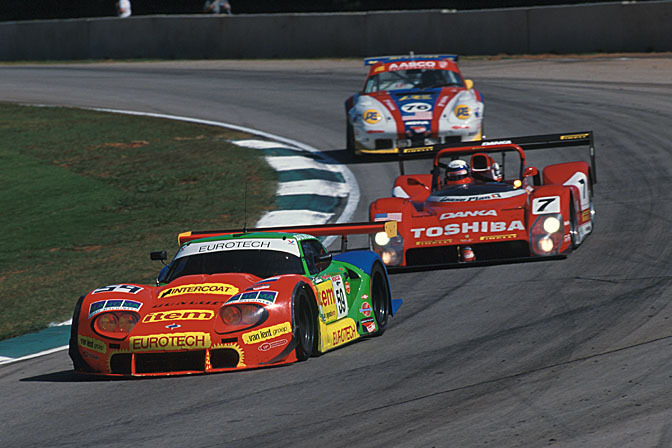 PLM 98 was the first leg of a trek that would take me on four years of covering motorsport in North America, which was fantastic. I don't travel as much as I used these days, cost and sheer bloody-mindedness of airports make me try and stay home but those years plying my trade across the country were unforgettable. Above you see my partner in crime when I go to the West Coast, Kerry Morse. It will come as no surprise that back in 98 after PLM we would up in Paddy's Bar, Chateau Elan. Well no digital back then and no processing till the morning and I had a bit of a thirst. Dave Price and his boys were there as was most of the shadier elements of the Paddock, the bar ran dry of beer………well they had not much experience of Brits and Germans back then. So Morse and I ended having a 3.00am breakfast at the local Waffle House, I should have heeded the warning……………. But what is the proto behind the TWR porche LMP1?? Looks like a Riley & Scott chassis to me. TWR Porsche...........you could write a book on that car.............and I'm surprised that no one has, certainly Tony Dowe could tell you a tale or two. 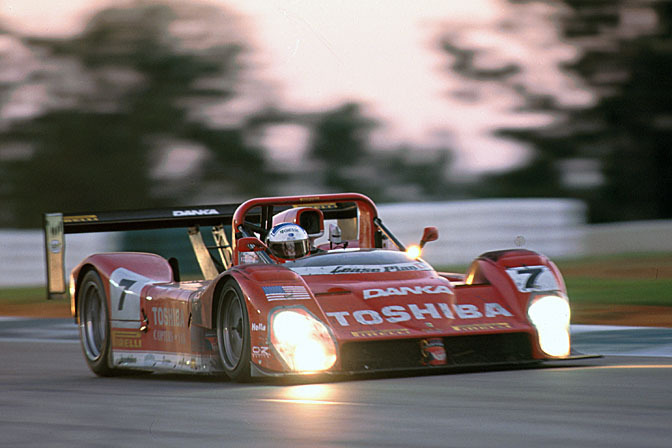 For 1992 the car became a Mazda MXR01, powered by a modified Judd V10. 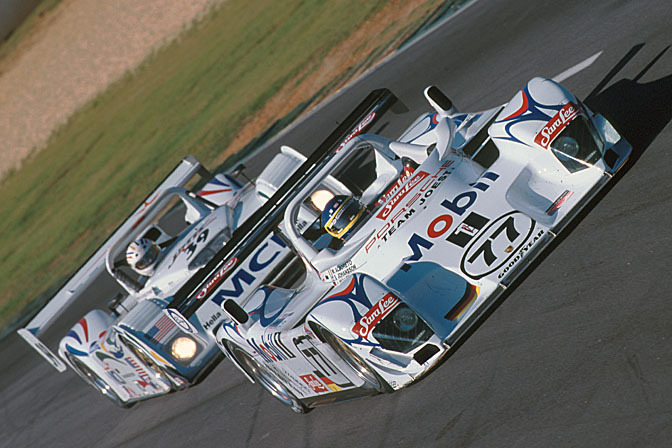 Group C collapsed at the end of that year. 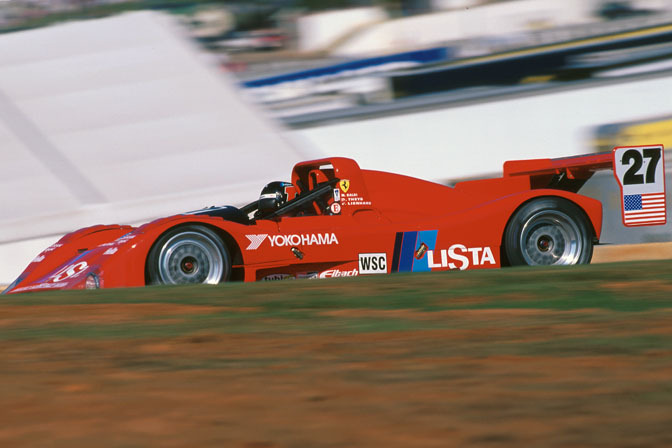 So in 1995 TWR converted the car for Porsche Motorsport to open top WSC rules, adding a 962 engine and transmission. They attempted to run the car at the Daytona 24 Hours, only for last minute rule changes to cause the factory to withdraw. 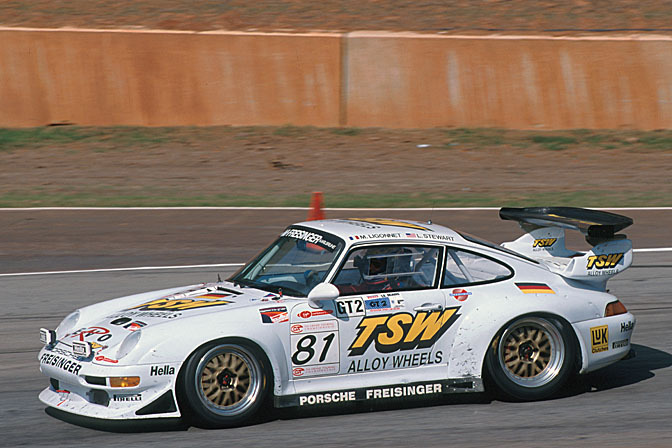 Porsche loaned Reinhold Joest a chassis for the 1996 Le Mans, which he promptly won. 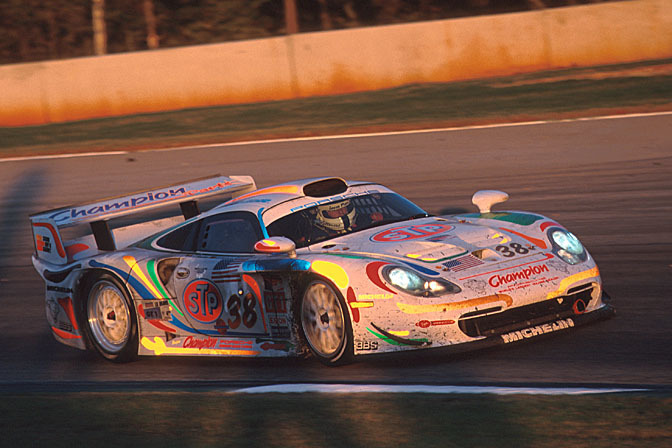 In recognition they gave him the car, which they regretted when he beat the factory GT1 effort again in 1997. Wow, these articles are amazing, thank so much for your contributions!